Not much today, just a door. I photographed it at 52 rue Saint-Georges in the 9th arrondissement. This neighborhood was very trendy during the last century (the 19th), so a lot of apartment buildings are actually high-end ones with lots of carving on doors and facades. There are so many beautiful doors in Paris. One could spend an entire Paris vacation photographing only doors. This one is especially fine, Eric. 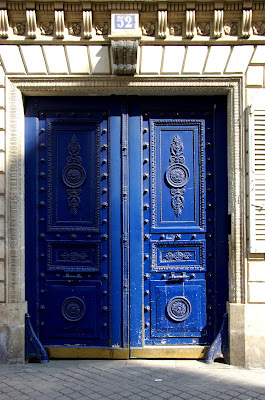 The last time I was in Paris, I´ve seen A LOT OF blue doors and I fell in love with each of them. Some day I will have a blue door... thanks for the photo. A fabulous door - beautiful tone of blue! I love that shade of blue- and doors are always interesting. Makes you wonder who lives behind them? The sunlight on the beautiful stone work (dentil moulding, brackets, floral medallions, etc.) surrounding the quinticential gorgeous Parisian blue door is just stunning, Eric. This neighbourhood always reminds me of Bel Ami...with Georges prowling the streets formulating his plans to secure fame and fortune. As Petrea wrote, one could devote a vacation just to the Doors of Paris. «Louis» found them fascinating enough that he has quite a number of them in his photo archive of the time he lived in Paris under the rubric "Parisian Doors". Fantastic, Eric. I shot a LOT of blue doors while I was there recently—but none as beautiful as this one. Well done, mon ami! I love these big old doors, I just imagine a big stone or marble staircase behind it. Oh, what a beautiful door! It looks very Napoleonic III! I love door and gates, so alluring. This is a lot more than "just a door," Eric. It is beautiful. I love this! My father worked in the door industry and had a collection of old beautiful doors. Random, I know! This door has me 'entranced'! Eric, you inspired «Louis» to begin a Monday series, Les portes de Paris. He began with one he found in the 6 ème. Not much? Look at this door!! Oh Yeah its door very beautiful and nice color. fantastic this post for door .